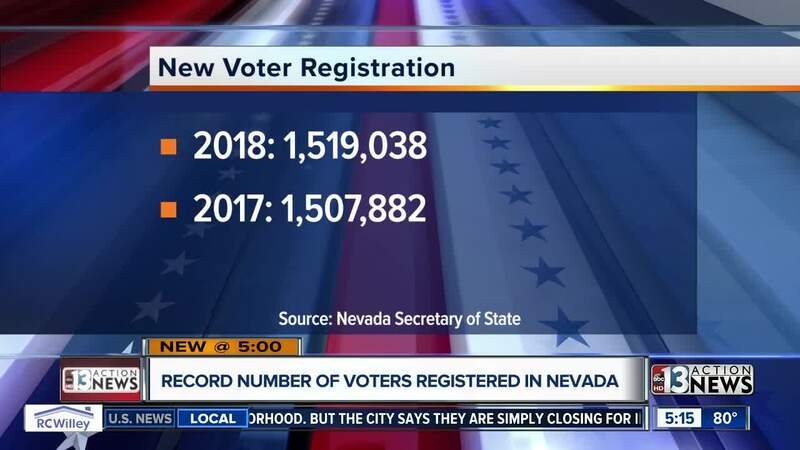 The November 2018 midterm election is around the corner and the key battleground state of Nevada has just set a new record for registered voters. The Nevada Secretary of State's Office is reporting 25,041 people registered in September, bringing the statewide total to 1,519,082 voters. The old record was set in Feb. 2017 at 1,507,882. The new registered voter record included people like William Watkins, who signed up in September. "It is simple, you just fill out the form, you need your ID and that's it," said Watkins. "It took about 5 minutes," he added. Watkins says there is too much at stake in the 2018 midterm election with several key Nevada races for Senate, House of Representatives and governor. "If you don't [vote], you can keep on complaining and nothing is going to change, we have to fight for what's right," said Watkins. When boiled down by party, Democrats hold a slight advantage, statewide, over Republicans in terms of newly registered voters in September. "The record is not that surprising," said Jon Ralston , political insider, and editor of The Nevada Independent. "Nevada has been growing, except for that small time during the recession, you're always going to have a record number of voters," he explained. Ralston says Nevada will continue to be a big swing state because the number of people who do not identify with any political party continues to grow. "Nonpartisan registration and non-major party registration is at an all-time high. It's close to 30 percent of the electorate," said Ralston. "That is a huge number," he added. Ralston says it remains to be seen if the national political climate will have an impact on Nevada voter turnout. "Is there more excitement because of Donald Trump, and because of Brett Kavanaugh? We are going to find out," Ralston said.